The following is an excerpt from my 2009 dissertation Preaching The Story Behind the Image: A Narrative Approach to Metaphor for Preaching. The LIFE IS A JOURNEY metaphor is prevalent both in our culture and in the Biblical text. The cognitive linguistic approach characterized by the work of Georg Lakoff, Mark Johnson, and Mark Turner is especially concerned with metaphors within the conceptual system shared by a culture. Their approach to metaphor makes a careful distinction between conceptual metaphors, which structure thought or experience, and metaphors at the level of utterance, which themselves are linguistic manifestations of metaphors already present in a conceptual system. Lakoff and Johnson give a summary definition: “conceptual metaphors are mappings across conceptual domains that structure our reasoning, our experience, and our everyday language.” For this approach, metaphors manifested in language are seen as reflecting patterns of cross-domain mappings already present in thought. In the prevalent culture, for example, people often think about, make decisions about, and experience the rather abstract concept of life in terms of physical travel or journey. This thinking, reasoning, and experiencing of life as a journey involves specific kinds of cross-domain mappings that are reflected in a wide range of linguistic expressions: “I took a wrong turn somewhere,” “She’s come a long way,” “We have a rough road ahead,” and so on. The person leading a life is a traveler. The means for achieving purposes are routes. Difficulties in life are impediments to travel. Progress is the distance traveled. Things you gauge your progress by are landmarks. Choices in life are crossroads. Cognitive linguistics suggests that interpreters understand both common, everyday metaphorical utterances like “I don’t know which path to take,” and unconventional, poetic utterances like Robert Frost’s, “The Road Not Taken,” by drawing on the structured set of conventional mappings in Life is a Journey. A uniquely narrative approach to metaphor helps describe the important relationship between a culturally shaped conceptual metaphor and how a particular metaphorical utterance is understood. 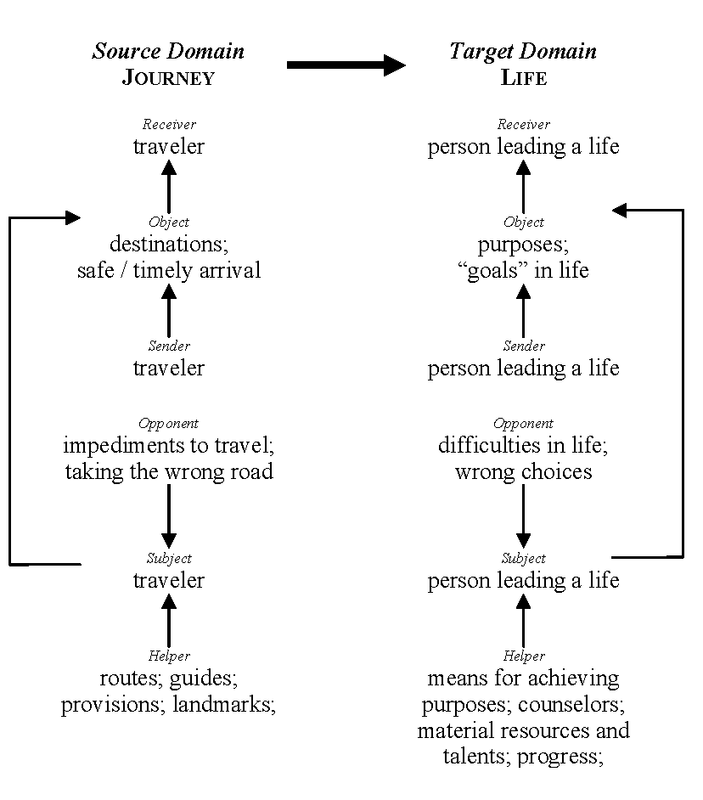 From a narrative perspective, the kinds of mappings that constitute the conceptual metaphor Life is a Journey suggested above fit well into an actantial model relating a traveler as Subject/Receiver to a desired destination as Object, with appropriate Opponents and Helpers in both the source and target domains (see figure 8, below). Filling out actantial models for both the source and the target requires decisions not only about how elements correspond across the domains, but how elements are related within each domain. Since the Lakoff-Johnson-Turner approach to metaphor understands mapping to include not only features or characteristics but relationships and structure as well, figure 8, by providing a structure of relationships, is in some ways more descriptive of a cognitive linguistic approach to metaphor than either the list given by Lakoff and Turner or the mapping diagram offered by Kövecses. What is unique in figure 8, however, is that the structure of both domains is understood as a narrative structure. The key components of the Life is a Journey conceptual metaphor noted by Lakoff and Johnson are related to each other narratively. Actantial models in the source and the target domains express these narrative relationships and how these relationships map across conceptual domains. Discrete elements in either domain that fulfill similar functions are grouped together under the same actantial position. Routes, guides, and landmarks, for example, are all Helpers; that is, they fulfill the same narrative function in the common understanding of how a journey works. Discrete elements in either domain that fulfill contrary functions are related as Opponents and Helpers. Guides help travelers avoid or overcome things like wrong turns. On the actantial model, a single actor has different kinds of relationships with other actors in different actantial positions. The relationship between guides and routes is distinctly different than the relationship between guides and wrong turns or guides and travelers. These relationships are not random or haphazard. Rather, they are the result of cultural and experiential knowledge of the kinds of things travelers want to happen and the kinds of things that help or prevent these things from happening. By expressing the structure of the conceptual metaphor in narrative terms, the actantial model makes important relationships within that structure more evident. Representing a metaphor with a list of unrelated mappings misses some of the most important aspects of interpretation. Understanding a metaphor includes not only knowing the significant entities or characteristics and their mappings, but what someone could reasonably expect from significant entities or characters as these actors fill different actantial positions that relate them all to each other and to the whole. Someone who knows, for example, that wrong turns and guides are both part of the metaphor Life is a Journey but thinks they are roughly equivalent in their function could not be said to have an adequate understanding of the metaphor. Understanding life as a journey entails knowing that guides function as Helpers, that wrong turns are Opponents, and that guides have a tacit relationship to travelers and destinations as well. The structure of metaphorical mappings evidenced both at the level of utterance and at the level of concept can be described effectively as a narrative structure. The model used here to describe this narrative structure includes the important relationship between specific actors and the actantial positions or roles that these specific actors fill. This relationship between actantial roles and specific actors helps explain why such a variety of linguistic expressions can be taken as instantiating a single set of conceptual mappings. The conceptual metaphor Life is a Journey consists of a structured set of narrative relationships that map from the source domain to the target domain. These mappings evidence stable relationships between actantial positions yet are also underdetermined enough to allow a multitude of specific actors to fulfill these actantial roles. The specifics listed by Lakoff and Johnson as well as by Kövecses should not be taken as a closed list of necessary and sufficient elements of journeys that map onto the domain of life. Rather, these are the kinds of things that fulfill actantial roles in a common understanding of how a story of journey (and of life) works. The Helpers are not limited to, nor must they include, routes, guides, or landmarks. Routes, guides, and landmarks are the kinds of things that help travelers get to their destination and therefore are good examples of the kinds of things that will be found in the Helper position in the broader actantial model of the source domain Journey. This stability of actantial relationships and underdetermination of specific actors is evident in the variety of expressions that share the same basic narrative structure. Speakers may use a variety of different kinds of journeys as the source domain in specific metaphorical utterances, but interpreters will still understand these utterances in terms of the basic conceptual metaphor Life is a Journey. People can be said to experience rough seas or smooth sailing in their life journey. They can stumble, get sidetracked, or even be derailed. They can walk the extra mile, get left on the curb, or miss the boat. Yet there are not a multitude of discrete conceptual metaphors such as Life is a Sea Voyage, Life is a Train Trip, Life is a Drive in a Car, Life is a Hike; there is one conceptual metaphor, Life is a Journey, instantiated by linguistic utterances that draw on a range of different kinds of journeys. The specific actors will vary from instance to instance, but the basic narrative structure remains the same. Stumbling, getting side tracked, and being derailed all count as Opponents in the basic actantial structure of Journey. Their role of Opponent is in turn understood in relationship to a range of other specific actors that could function in other actantial positions. Getting back on track or being sure-footed in life are Helpers not necessary to every instance of Life is a Journey but nonetheless understood in light of the narrative structure of this conceptual metaphor as a whole. Life is a Journey is a conceptual metaphor. As such, it provides the basic structure needed for a competent interpretation of a wide range of metaphorical utterances. Knowing the basic correspondences between the domain of Life and the domain of Journey described by the conceptual metaphor Life is a Journey makes sense of utterances like “He got a head start in life. He’s without direction in his life. I’m where I want to be in life. I’m at a crossroads in my life. He’ll go places in life. He’s never let anyone get in his way. He’s gone through a lot in life,” to name just a few. Each of these specific instances of a metaphorical utterance leaves much unsaid. Since the development is low, the number of blanks to be filled in by the interpreter is relatively high. An interpreter, however, is not left to fill in all those blanks randomly or at whim. In the absence of specific development or context, the narrative structure of the appropriate conceptual metaphor, in this case, Life is a Journey, will guide and constrain the narrative structure—and therefore the interpretation—of these metaphorical utterances. Any interpreter who knows the conventional mappings associated with Life is a Journey needs very little contextual development to understand an utterance like “I took a wrong turn somewhere.” Knowing about journeys means knowing about destinations and wrong turns and how they relate. Understanding life as a journey means knowing what is at stake in getting “back on track,” how to evaluate the situation, and what might be expected next. Understanding life as a journey means having some idea of the feelings involved in getting lost or sidetracked, what the options for the traveler look like, and more. Understanding life as a journey means knowing the conventional structure and mappings associated with Life is a Journey. For a more complete discussion of the contemporary cognitive linguistic approach to metaphor, see appendix 1: Describing the Duality of Metaphor. George Lakoff and Mark Johnson, Philosophy in the Flesh: The Embodied Mind and Its Challenge to Western Thought (New York: Basic Books, 1999), 47. “Metaphorical mappings are fixed correspondences that can be activated.” George Lakoff, “The Contemporary Theory of Metaphor,” in Metaphor and Thought, 2nd ed., ed. Andrew Ortony (Cambridge,UK:CambridgeUniversity Press, 1993), 218. “What does it mean to know a metaphor? It means to know the systematic mappings between a source and a target. It is not suggested that this happens in a conscious manner. This knowledge is largely unconscious, and it is only for the purposes of analysis that we bring the mappings to awareness.” Zoltán Kövecses, Metaphor: A Practical Introduction (New York:OxfordUniversity Press, 2002), 9. “When we know a conceptual metaphor, we use the linguistic expressions that reflect it in such a way that we do not violate the mappings that are conventionally fixed for the linguistic community. In other words, not any element of b can be mapped onto any element of a. The linguistic expressions used metaphorically must conform to established mappings, or correspondences, between the source and the target.” Ibid. Mark Turner discusses how mapping from the source to the target is constrained by important structure in the source domain. His observation about one important constraint on cross-domain mapping, called the Invariance Hypothesis, is true of the constraints of conventional mappings as well: “The constraint is not inviolable; however, if it is violated, the violation is to be taken as a carrier of significance.” Mark Turner, “Aspects of the Invariance Hypothesis” Cognitive Linguistics 1–2 (1990): 252. George Lakoff and Mark Turner, More Than Cool Reason: A Field Guide to Poetic Metaphor (Chicago: University of Chicago Press, 1989), 3–4. Zoltán Kövecses, Metaphor in Culture: Universality and Variation (Cambridge, Mass. : Cambridge University Press, 2005), 123. Lakoff and Johnson also use this “equivalent arrow notation” to offer a simpler version: “Journey → Purposeful Life; Traveler → Person Living A Life; Destinations → Life Goals; Itinerary → Life Plan” (Philosophy, 62). Presenting a list of mappings in this way helps make the direction from the source domain to the target domain more evident. What is still lacking, however, is any representation of the structural relationships between elements within the same domain. How destinations relate to purposes in life is clear; but how do destinations relate to travelers or guides? Lakoff and Turner, More, 3. Lakoff and Turner, for example, work with a “skeletal form or ‘schema’” consisting of “slots,” “relations,” and “properties” (More, 61–63) that fit well with the narrative theory suggested here. One of the strengths of the current presentation is its ability to answer the question why these slots, relations, and properties as opposed to other plausible possibilities. Choosing elements from the source domain of Journey is not arbitrary. Relevance to the culturally understood “story” of the prototypical journey will guide and constrain which actants, actors, and relationships are selected for possible mapping. See the discussion of underdetermination in chapter 3, above. To be exact, the designation “Life is a Journey” names a source domain (Journey) and a target domain (Life) and says they are related somehow (is). This shorthand stands for a structure of conceptual mappings from the domain of Journey onto the domain of Life. Lakoff, “Contemporary Theory of Metaphor,” 223. Though Black, for example, sees the importance of cultural knowledge for interpreting metaphor, he emphasizes the role of context, what he calls “ad hoc associated commonplaces” (Models and Metaphors, 43). Forceville, Pictorial Advertising, likewise understands both the broader culture and more discrete subcultures (“target audiences”) as significant to metaphor interpretation while focusing much of his discussion on the role of context, both textual and pictorial. The cognitive linguistic approach characterized by Lakoff, Johnson, and Turner show the opposite tendency. Though they acknowledge the role the context of an utterance can play in shaping metaphor mapping, they are much more interested in the way our conceptual system at a cultural level shapes the way we think and talk. If you have any doubt that you think metaphorically or that a culture’s metaphors affect your life, take a good look at the details of [Life is a Journey] and at how your life and the lives of those around you are affected by it every day. As you do so, recall that there are cultures around the world in which this metaphor does not exist; in those cultures people just live their lives, and the very idea of being without direction or missing the boat, of being held back or getting bogged down in life, would make no sense. Lakoff and Johnson, Philosophy, 62, emphasis added. it is really interesting, Godspeed Justin.